A lot of players from many nations have been interested in quizzes a lot, so Minecraft Quiz V1.4.7 game is made to meet players’ needs. The steps are so simple that you read first and then click the correct options to answer the questions. If you click wrong options, you have to go back the previous checkpoint, which comes after 5 questions. Furthermore, you have no under pressure of time. 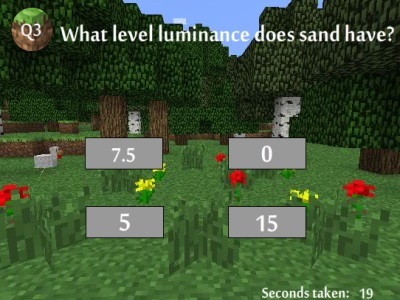 Answer the questions in Minecraft Quiz V1.4.7 correctly and in other quizzes to prove that you are a fan of Minecraft! We love serving you with games of high quality. You use the mouse to play MineFlash.